I have many baseball resources in town. I will do some research and see what I can come up with. I was younger at the time, but my memories of Potash are very vivid. As I mentioned in a previous post, when Potash died he was cremated. Per his wishes, his cremains were buried under home plate at Admiral Mason Ballpark. When they started the demolition for the Veterans Memorial, there is no telling what happened to his ashes. BUT I DO KNOW WHERE HIS SOUL IS!!!!!! This is definitely Admiral Mason Ballpark. You can tell by the box seating area. From what I was told, Potash got his nickname from an incident with potash as a child. He also stuttered. He loved what he did and loved every ballplayer as though each was his own. As much time as I spent at that ballpark	, (which was A LOT) I never saw Potash say a cross work to anyone. A lot of people don’t know that Potash lived at Admiral Mason Ballpark. My Daddy and Uncle, better known as Buddy and Eddie Pursell were fixtures at the park coaching Babe Ruth. Uncle Eddie died unexpectedly in February 1973 but Daddy kept coaching into the ranks of Connie Mack. That was played at the fields at the airport. Only a few people know that after Potash died, he was cremated, and buried under home plate at Admiral Mason Ballpark. When demolition began on the park, there is no telling what happened to his ashes, but I do know where his soul is!!!! 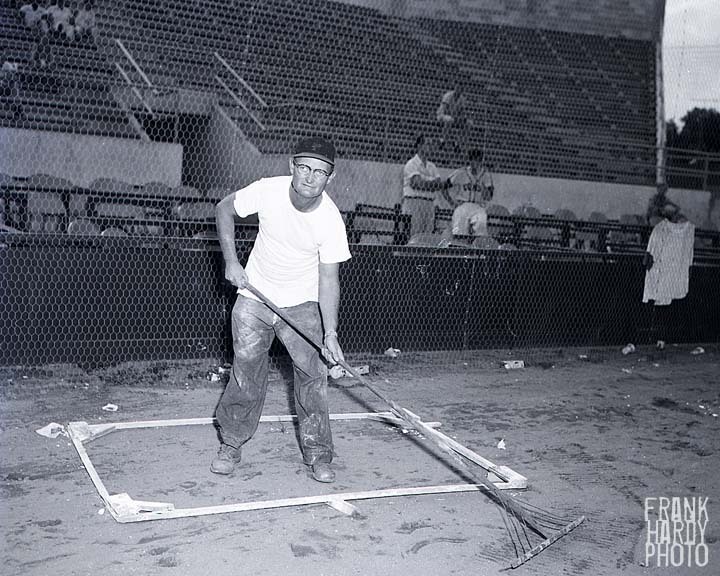 Potash was also the grounds keeper at PHS when Fred Waters coached there. Tommy Hughes PHS Class of 1966. Great photo. The groundskeeper was called “Potash.” Why, don’t know. I recall he was named ground’s keeper of the year in the AFL around 1959. Absolutely, Rick. As soon as the picture popped up on my screen, I said to my wife, “That’s Potash!” In addition to going to many games there, I sold refreshments there with the Knights of Columbus. Is this picture of Admiral Mason Park? Also, most protective screening runs behind home plate and runs up both sides to somewhere short of the dugouts which of course allows trash to be dropped or thrown from the stands plus wind would blow it all around the field. Just the same, what a great picture. Wasn’t Coast Photo owned by the Melton family? Terry … Thanks for the comment and I agree with what you say. The photo just looks “still” to me, there does not look to be anything moving / blowing around in the photo and the trash could have come from the players themselves … it just looked like a lot of trash to me. The point I really tried to make was how happy the grounds-keeper seemed to be doing his job. This being back in the 1950’s, he most likely only made a couple of dollars an hour, if that, but he sure did seem happy and he was proud of the job he was doing … something many people today do not have. I do not mean to get too philosophical with my comments, just a quick observation along with the photograph. What I really am interested in finding out is who this man is. Trying to put a name behind the face. And yes, a man by the name of Chick Melton owned Coast Photo. He was an ex-Marine pilot that retired here with his family … he was nice to my father and me. I was surprised when Coast went out of business … you would have thought that he could have sold the business to someone because I am sure that it made money. Maybe someone out there might have something to add.